Information on using EndNote, with links to resources. 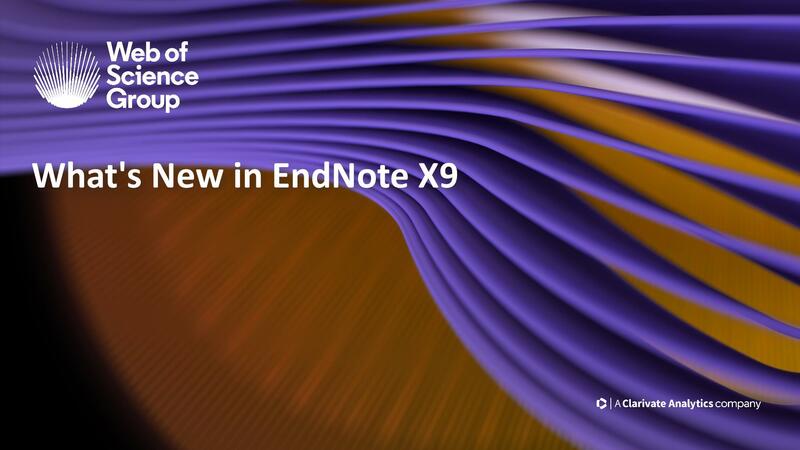 An overview of the new features in EndNote X9. A fast start in using EndNote on Windows. A fast start in using EndNote on Macintosh. Below are downloadable versions of the EndNote X9 videos. These are zipped files. You will need to extract them after downloading before playing them. They are in the MP4 format and should play in most video players. These files have captions and the full-length classes have chapter markers. On Windows, you may need to use a program other than Windows Media Player to access chapter markers and subtitles. 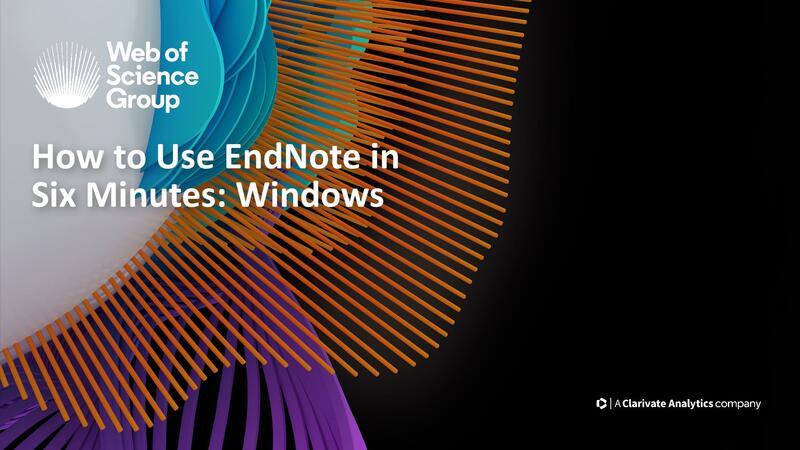 A fast start on using EndNote on Windows. A zipped file containing reference materials for during and after EndNote classes. Class notes in PDF format for a basic to intermediate EndNote class. Step-by-step instructions for installing EndNote and for using many of the popular features in EndNote. This guide provides descriptions of what the major menu items in EndNote X9 do. A quick reference for working with EndNote X9 on Windows. 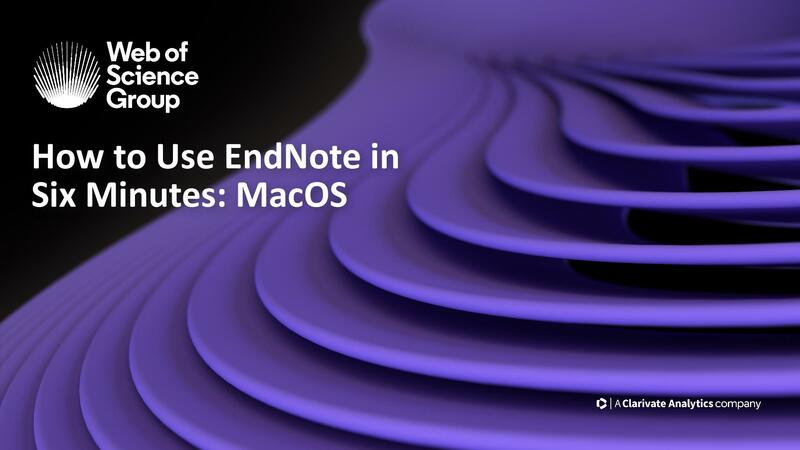 A quick reference for working with EndNote X9 on macOS. A step-by-step tutorial in using the basics of EndNote X9. A guide to editing EndNote styles and references types, for Windows. A guide to editing EndNote styles and references types, for Macintosh. This is a general link to the full channel, with over 100 videos available for recent versions of EndNote. Compare EndNote X9 to the previous two versions. This Article is intended to restore the EndNote Cite While You Write (CWYW) tools on Windows based systems. If you’ve never seen the EndNote tools loaded in Word, please see the Article with installation steps for your version of EndNote and Word. Word processor compatibility for the current version of EndNote. The system requirements for the current version of EndNote. Scroll to the bottom of the linked page to search the knowledge base. You will need a product key to install a permanent copy of EndNote. MacOS versions 10.12 (Sierra), 10.13 (High Sierra), and 10.14 (Mojave) contain features to save the contents of the Documents folder in iCloud and to "optimize" storage by storing less-used files only in iCloud online. EndNote libraries stored in iCloud, even when stored on both the hard drive and online, are subject to corruption over time. If you choose to store your documents in iCloud, we suggest creating a separate folder in your home folder and saving your EndNote libraries there. Do not store EndNote libraries in iCloud or any other cloud-syncing folder, and do not store EndNote libraries in the Documents folder if you have selected the option to store documents in iCloud. You can find more information on these features on the Apple support site at these locations. References in EndNote libraries can be synchronized between desktop and laptop computers, the online library, and an iOS device using EndNote Sync. Complete EndNote libraries can be shared with other EndNote X7, X8, or X9 users through EndNote Sync and Library Sharing.